Working in a cubicle can be boring and monotonous. For Kristin Collins of New Milford, getting out of the cubicle at her job and finding a greater purpose in life was top on her priority list a few years ago. Then, "something snapped in the brain and we said `Let's do it,' " Ms. Collins said. Ms. Collins and her friend, Jaymie Lanera of Golden's Bridge, N.Y., both 26, co-founded the Elisa Lanera Foundation (ELF) -- named for Ms. Lanera's late mother, who was killed by a drunken driver three days after Jaymie's first birthday. Founded in 2008, ELF focuses on education and HIV/AIDS awareness in poor townships and underdeveloped communities in Africa, and has future plans to establish itself building schools and creating curricula in South Africa. "I'm grateful at the end of the day for what I do," said Ms. Collins of her new role as director of ELF. "It's so rewarding." The duo returned home in May from a two-month trip to Abokobi, a small village in the Accra region of Ghana, where they oversaw the construction of a learning center/ library at the Kiddy Kare Nursery and Preparatory School, funded through ELF. Although Ms. Collins had never been to a third-world country before, her nerves were immediately settled upon meeting the people of Ghana. "They're so warm and welcoming," Ms. Collins said. "They know we're there to help them." While the purpose of the trip was to monitor construction and establish the center (see sidebar), Ms. Collins and Ms. Lanera discovered the school lacked a very important resource. The school's 80-year-old proprietress informed them the school had only one instructor, the preschool teacher. Immediately, Ms. Collins and Ms. Lanera stepped up, offering their skills. They became teachers of English, social skills, science, geography, math and writing for students in grades 1 to 6. They also incorporated HIV/AIDS education into the curriculum, and Ms. Lanera taught French. Additionally, they educated their students of the importance of hygiene and clean water. One day, more than 20 Kiddy Kare students teamed up with BrainBirds Academy in Accra, Ghana, to pick up trash in the community through the Keep Ghana Clean Project. The children, who speak three languages -- Twi (the language spoken in Ghana), Ga (the regional language) and English -- are hungry to learn. "The kids are so eager to learn... they love school," said Ms. Collins, who noted students "begged us for more classes." Ms. Collins related the story of inviting students to one particular site -- an old chicken barn next to a field where the children play -- after school, where she planned to go over the items that were going to be on an upcoming exam. She waited for 45 minutes for the students to show up. When the students arrived, albeit late, they had brought other children from all around the village, not just those enrolled at the school. "It was the most rewarding feeling of my life," she said. She described how, every time she looked up, she saw two more kids poking their heads out from behind a tree. As teachers, Ms. Collins and Ms. Lanera had access to a limited number of books and computers that had been locked up due to lack of supervision by teachers before their arrival. Still, access to what Americans deem to be everyday items such as the Internet, television and other luxuries is non-existent. Ms. Collins said she had to travel quite a distance in a tro-tro (a cramped, taxi-like vehicle) to get access to the Internet at a hotel. From Ghana and via occasional email access, she planned ELF's annual golf fundraiser, which was to take place two to three weeks after she returned home. While living in Abokobi, the women stayed in a compound with a family consisting of more than 20 people, not including themselves. Children from the school often stopped by the house to visit their teachers. "The people [there] are so happy," Ms. Collins said. She described the community in which parents happily sell bags of water on the sides of street and children joyfully and innocently play in dirt. Ms. Collins related a story of walking with children in the village. "There were five kids holding my hand," she said, noting one had a pinky, another had a thumb, and others tagged along however they could hold her hand. 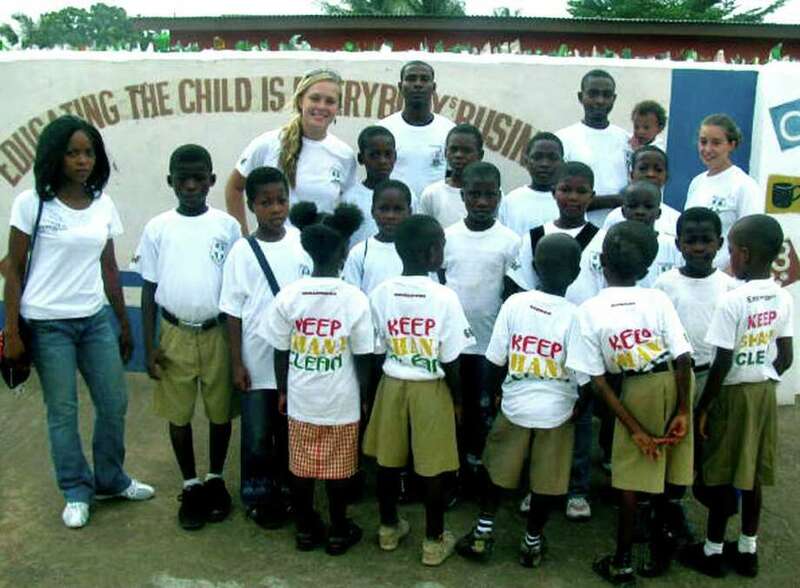 "I wish it was feasible to go back for a weekend," Ms. Collins said of her wish to go back to Ghana. "The people are just wonderful... I miss the people." Running a non-profit organization has been more rewarding than Ms. Collins had expected. "We wanted to do this ourselves, do it the right way and with a good heart," she said. John Harris, owner of White Horse Country Pub and Restaurant in Marble Dale, where Ms. Collins has worked for more than two years, describes his employee as "an ambassador of good will." "We should all leave the world a better place than when we found it," said Mr. Harris, who cited Ms. Collins' ELF project as an example. "[Her work] behooves us all," he said. Ms. Collins said she does it for one reason: "I feel like I was meant to do this." For more information, email Kristin Collins at kristin@elfhelpsafrica.org or visit www.elfhelpsafrica.org.